We recently returned from Austin after meeting our newborn grandson. I felt this photo of father and son was one of the better ones I captured. I chose to focus on the two of them and not the background or clothing and to highlight the comparative skin tones. This is my friend Saaduuts. He is a Haida, originally from Alaska. 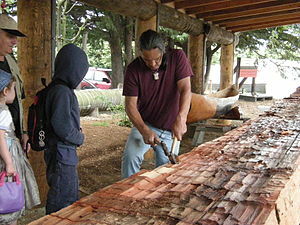 The canoe he is carving is 32 feet long and 42 inches wide. It’s being carved from a single cedar log that had been in storage for 40 years. The sides need to be steamed again to further widen and straighten them. This is Saaduuts’ 5th canoe. He is somewhat of a shaman as well as a canoe builder. On the last 4 canoes, he has involved youth groups to complete the work. He sees these as healing projects. Healing between peoples and between people and the earth. He was waiting for the afternoon group to show up while we talked for awhile about things nautical and spiritual. Before he went back to work, he said goodbye with a Haida blessing and prayer song. Like an old man warming his bones one last time in the sun, the remains of a decaying tree lean to catch the light while resting quietly with ferns for blankets on cold feet, bird-songs and a murmuring brook in place of an elegy, surrounded by strong scions and old friends.